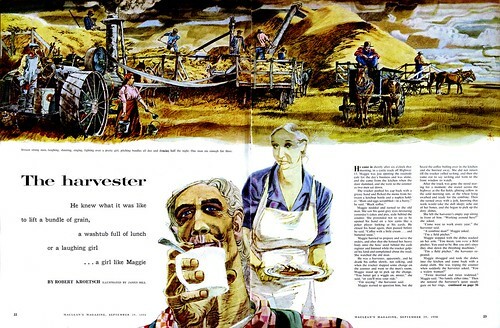 This week we've been looking at the American farming tradition and since Canada is part of North America, I think I can validly include this piece by one of my country's greatest 20th century illustrators; James Hill. Its thanks to my friend, Dan Milligan, that I had the opportunity to spend a few hours over lunch one day several years ago with Jimmy Hill. Dan clearly had tremendous respect and admiration for his former teacher at The Ontario College of Art ( now OCAD ) and I'll always be grateful to him for inviting me along to experience James Hill first hand. Hill had become a legend in the Canadian graphic arts community many years earlier, not only for his tremendous talent, his success in that mecca of commercial art, New York, but also for his many antics and his fiery temper. That day he was in great spirits, having come through a long, difficult and mostly self-inflicted dark period. Lunch was filled with laughter and light, and many outrageous anecdotes from Jimmy's long and illustrious career. I'll always remember that day with great fondness. You can see a small sample of Hill's work in my James Hill Flickr set but I especially recommend reading the article on the artist here. That's a great story, M - and I'm sorry to say, I don't have the rest of the story because I never actually had the magazine...the scan was contributed by my good friend Réne Milot. I will ask him if he still has the magazine somewhere. Another Jimmy Hill story: An AD at the agency where I started out ( Ogilvy) had convinced Heinz to let her use Jimmy for an ad campaign. Knowing how notoriously unreliable he had become she tried to make everything as easy as possible for him - doing a super tight layout and delivering it to his studio. he promptly tore it up, saying, "I don't work from layouts." Time went by and deadlines were missed - the client became understandably miffed - but still she managed to keep them and the agency on board. Frequent visits to Hill's studio showed a fantastic painting taking form, but his progress was agonizingly slow. She was becoming frantic. Finally, now months after the original deadline, the painting was 98% percent done. Come back tomorrow and you can take it away, Jim told her. When she arrived the next day the painting was gone, another brand new equally accomplished but entirely different painting resting on the same easel the Heinz piece had occupied for all those weeks and months. "But, Jimmy, where's my painting?" she asked. "That is your painting," Hill responded, drink in hand, from his seat at the ever-present kitchen table at the back of the studio. I've got an article at home from an early issue of (I think) Communication Arts which focusses on James. If I get a chance I'll scan it and pass it on. Ooops - sorry, that was me. competing against him. Once he came late to class with a black eye from a fight at the bar across the street from his lonely dundas street studio. He was an artist first. He should really get much more credit in history then he has todate, as he was a trend setter without knowing it. Jame hill, was to be the next Rockwell, but time got in the way, times were a changing. He still worked through the change to create masterful works of art. Once he was paid for an illustration in the form of free airfare to japan for his work on a travel ad. Like many artist he loved to drink to much. But man was he good I really enjoyed watching him paint, great control. 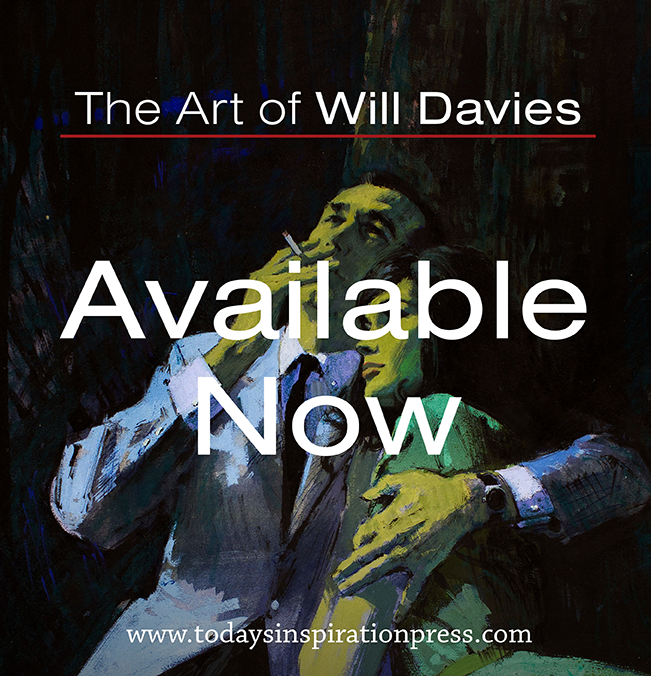 James Hill was a master artist with a great life story, that may never be fully told! One of Canada's unknown talents that help shaped the culture of the 60s, and the warholin times we live in now. Five stars. I told my wife that I'd like to watch the 2011 Jane Eyre movie with Mia Wasikowska and Michael Fassbender. She said, "You absolutely must read the book first." So I dug her old college paperback version out of the bookcase, and am now greatly enjoying it. I was just admiring the cover, so I Googled "James Hill" and ended up here. Illustration is indeed an underappreciated art form.